I once went to the yearly Italian festival at my parish -- a big affair with lots of food and music. 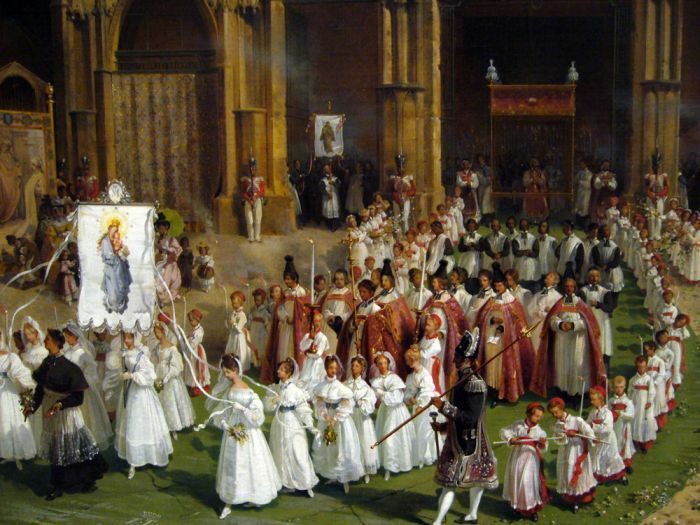 Most beautiful of all, though, is the procession of the statue of the Blessed Virgin. I was standing on the steps of the church, watching as Our Lady was carried down the street, set on a wooden platform hoisted by the men of the church. Next to me was a complete stranger, but when the Virgin came by us, the stranger and I looked at each other and burst into tears. It was such a beautiful thing to see Christ's Mother -- our Mother -- being honored so publicly, in broad daylight, while hundreds watched or participated. Such a procession is good on so many levels: the honoring of a Saint or the Blessed Sacrament is right and good in itself; being a part of such an event is good subjectively, psychologically; and, on a sociological level, it evangelizes, and it binds the faithful together, allowing for a shared ritual that goes to group cohesiveness. That woman and I, a woman I'd never seen before or since, shared a profound moment together, and I will never forget it. II Kings 6:1-5 (II Samuel:61-5): And David again gathered together all the chosen men of Israel, thirty thousand. And David arose and went, with all the people that were with him of the men of Juda to fetch the ark of God, upon which the name of the Lord of hosts is invoked, who sitteth over it upon the cherubims. And they laid the ark of God upon a new cart: and took it out of the house of Abinadab.... [T]he sons of Abinadab, drove the new cart.... Ahio having care of the ark of God went before the ark. But David and all Israel played before the Lord on all manner of instruments made of wood, on harps and lutes and timbrels and cornets and cymbals. Next in Scripture is Our Lord's procession into Jerusalem, riding on a lowly donkey as the people who'd soon betray him waved palms before the man they misstook as a mere earthly king. 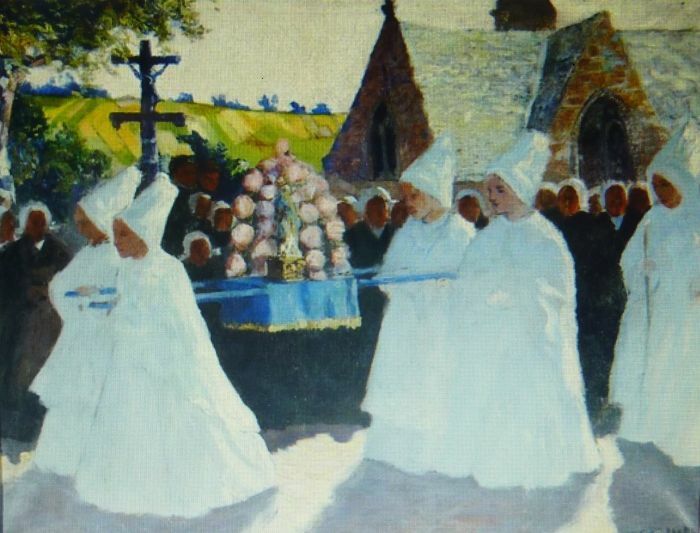 The Church has made use of processions since Her earliest days, and processions come in many forms. Though not typically perceived as "processions," the sprinkling of holy water on parishioners before Mass and the carrying of the Cross and candles and such are a sort of procession. There's also the procession of the bride on her seemingly endless walk down the aisle on her wedding day. And there are funeral processions -- from the solemn, to the boisterous as seen in New Orleans, complete with jazz bands. 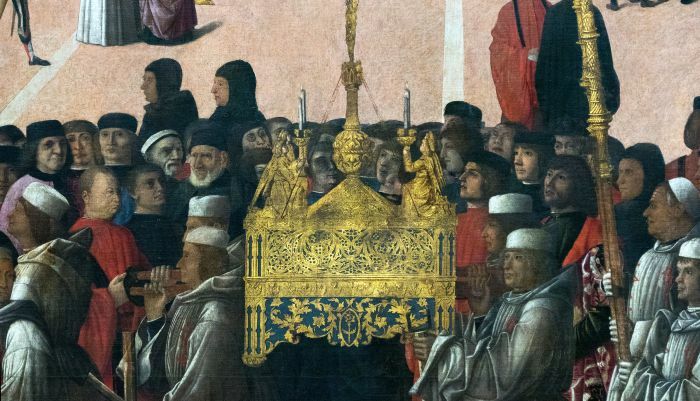 More formally, there is the procession of the Blessed Sacrament, a form of Eucharistic adoration which always take place on the Feast of Corpus Christi, but which can also take place on other days, at a priest's or bishop's discretion. Liturgically, there are the procession with candles at Candlemas, the procession with palms on Palm Sunday, and the "beating of the bounds" on Rogation Days. Sometimes these processions take place inside the church building, sometimes outside of it. 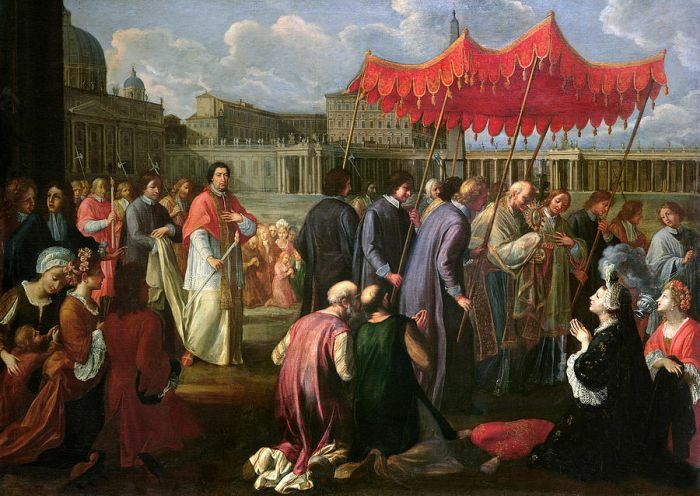 Outside of the liturgy, there are processions in honor of various Saints on their special feasts or for the cause of making a specific request of them -- i.e., a procession in honor of St. Januarius to request his prayers in protection against Mt. 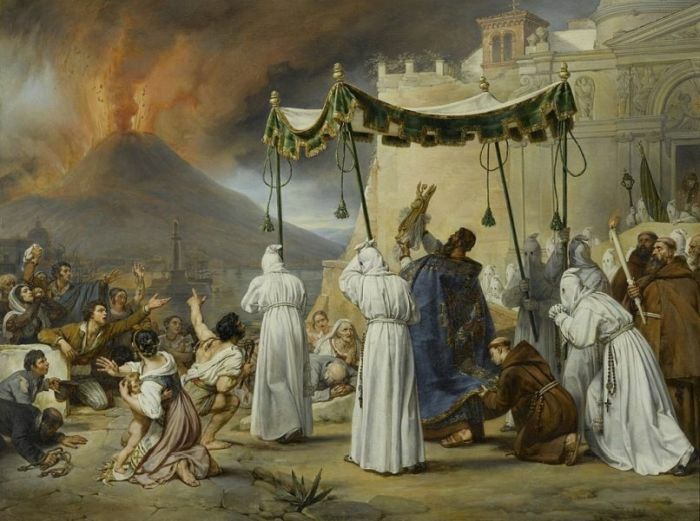 Vesuvius's anger, as is being done in this painting. 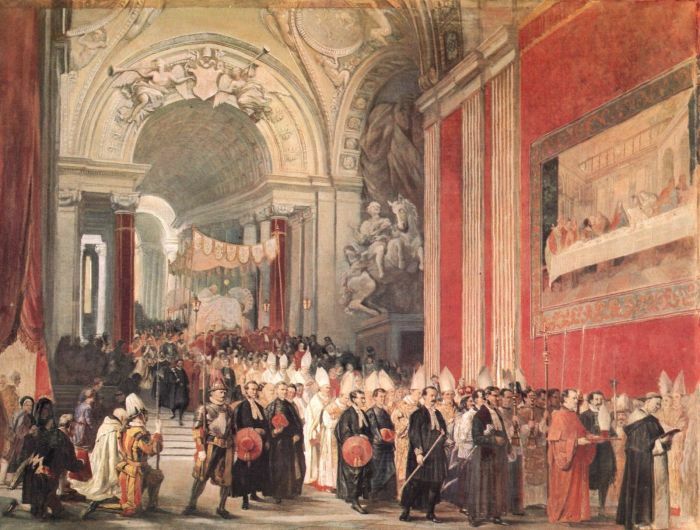 The Roman Ritual has procession prayers to ask for rain, ask for fine weather, and drive away storms; to protect against famine, plague, war, and calamity; to give thanks; and for the "translation" (the moving) of important relics. On these occasions, the Litany of Saints is prayed. 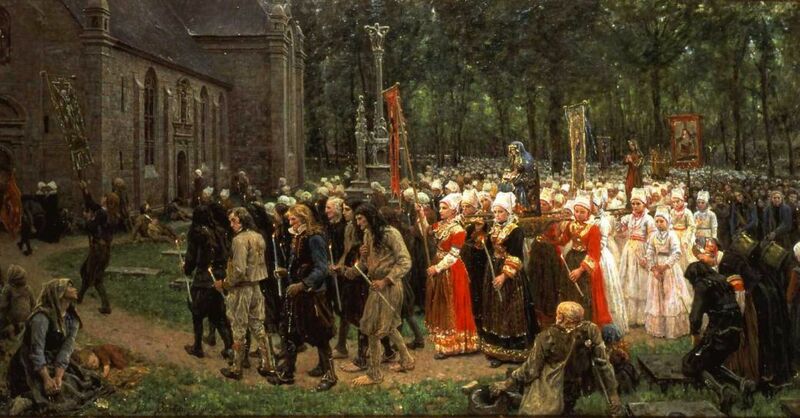 There are are also processions such as the one I described earlier -- done at a parish or diocese's pleasure. These sorts of processions can involve carrying a statue or icon of the Saint, the Saint's relics, etc. Often, when a part of the procession, men who belong to Catholic fraternal organizations, such as the Knights of Columbus, will wear their ceremonial outfits, young girls will wear their first Communion dresses, etc. 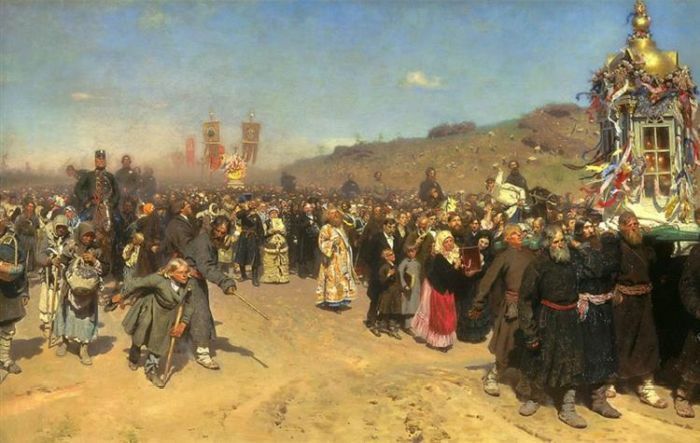 Below are a collection of paintings depicting processions of various sorts.